So many contests, so little time! i have been SUPER busy with EVERYTHING! But I have decided to enter a couple contests, Ruby Lockwood is a talented beader and wonderfully sweet teacher on YouTube who hosts a monthly contest where she gives away a 'ton of stuff' to the lucky winner. You have to make something from one of her tutorials and post it to her facebook page https://www.facebook.com/rlIbead4u ...She decides the winner by votes between family members. How genuine, huh? I love beaders, they are just real people. Who have a real life and although they may be famous, it doesnt go to their head. 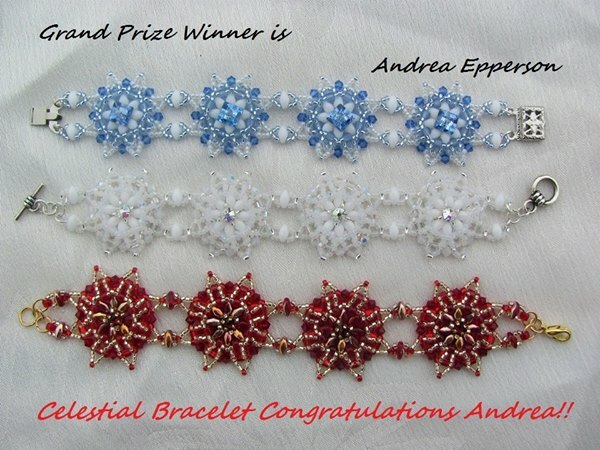 Also thanks to Gianna, who hosts several YouTube channels https://www.youtube.com/user/B4Pbakup ..( is my personal favorite) for letting me know about the Preciosa Ornela facebook page and providing links for thier contests, which are also monthly and you can win a kilo of free beads! Whoa! I have to say something about Gianna here, I have been following her on YouTube for some time now and I really think that she has come a long way with her beading life and I have a great respect for her beading style. I too am a bit of a perfectionist and I will take something apart numerous times and remake it (wasting a ton of expensive Fireline BTW) until it is just so. I mean there cannot be a scrap of thread showing or bead out of place for me! It really annoys my Ma :) But it is what I do. Why waste your time to make something you feel is 'ok' when you really want to say "This is Awesome! I'm proud to have made this and proud to share it with somebody or everybody." I love the fact that Gianna buys her beads from the same store as I do http://www.auracrystals.com/ is thier website they also have a shop on eBay. How ironic, I gotta say. I will post pics of the creations I enter the contests with soon, and let ya'll know if I win or even get recgonized 'grimace' surelythere cant be too much bad come of it, maybe get a few more followers , that would be cool too. I'm off to try and squeeze some Preciosa beads into my tiny budget this week, maybe some charlottes, or farfalle. Wish me luck! I have had the priveledge of watching her hunt which she does is in the wee hours of the morning, (probably because the cats are all asleep somewhere.) Someone suggested I put her outside a few days ago, why in the world would I wanna do that? She has PLENTY to eat here, she is fairly safe from predators staying high up on the ceiling most of the time, coming down only at night after the humans and cats have left the room. She really has it made. 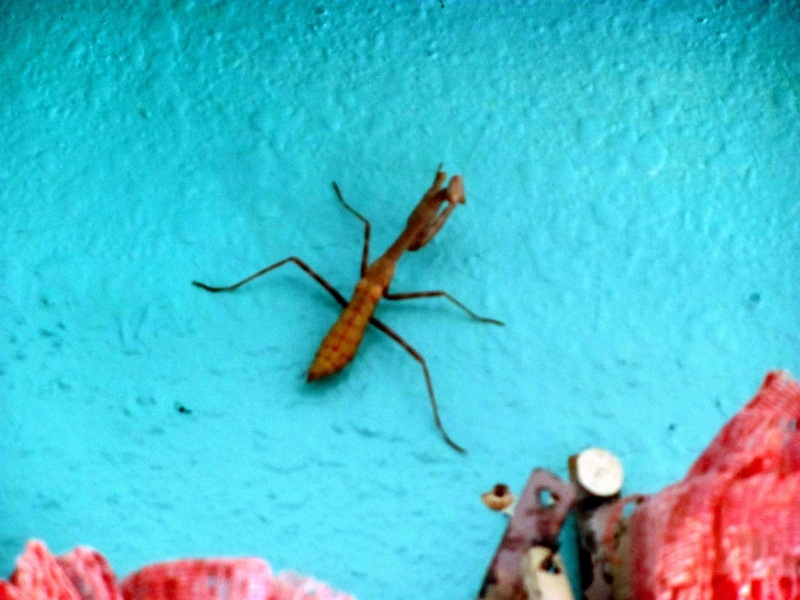 In all the houses I have lived in this is the 'buggiest'. Just now she caught a small mothlike creature for breakfast. How interesting to watch how slow they move until prey is within their grasp. 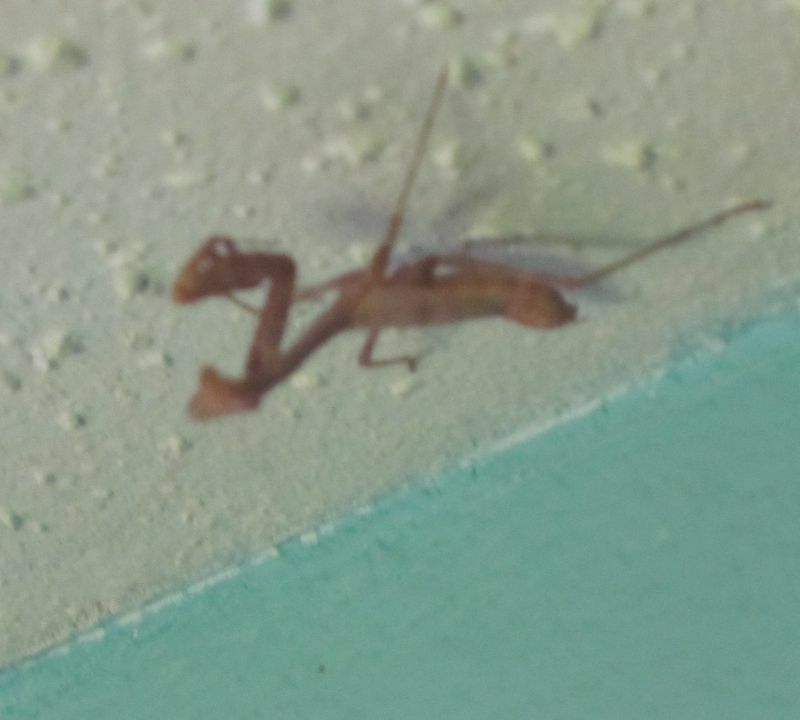 And contrary to my Mom's belief they do change color to blend in with their surroundings because she developed spots on her back as she slowly rocked her way up the curtain to catch the little moth. She watches me too I think, with 5 eyes I'm sure she can see what goes on here quite well. Now she is cleaning those deadly pinchers and probably preparing to find a good hiding spot for the rest of the day. It's interesting to have her here, especially when she surprises me by being somewhere I didn't expect, like perched atop my wrap when I reached to put it on. "Oh, hello, I really wasnt that cold, really." But she slowly rocked away from it as if to say, "Here, I'll move, just trying to get a better angle on that flourescent light ya got there." It amazes me she has survived my cats, she must be quite smart for a bug her size. I read that they can live up to 14 months in captivity, I really wouldn't consider my house 'captivity' as she made her way in here of her own free will and stays of her own free will, but without natural predators she could possibly live a long time in here. I have bugs of all sorts for her to hunt and eat. We'll see how long she survives my jungle, and hope she eliminates some pesky flies, beetles, moths and maybe even some scorpians and spiders. I swear sometimes that I have the weirdest luck on earth. The strangest things are always happening to me, ironic things that don't happen to other people on a regular basis. 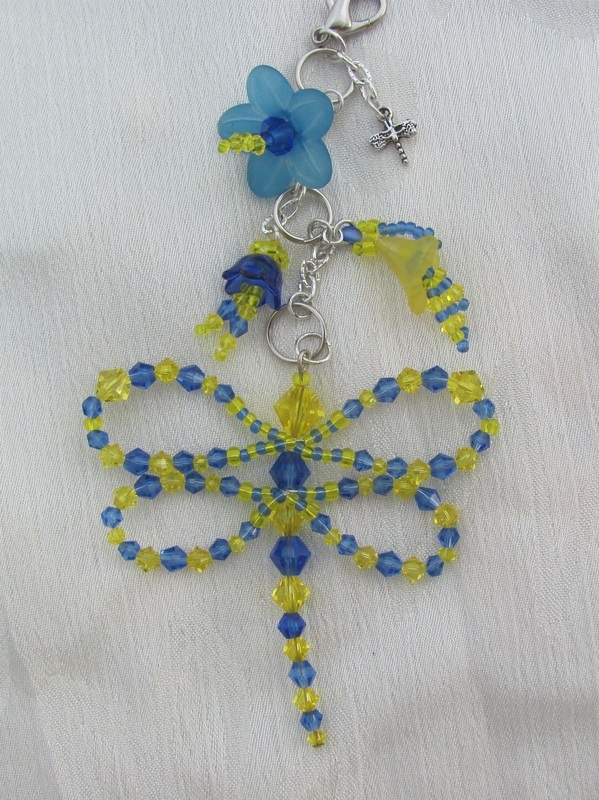 Out of all the things I've made, my dragonflies have been the most popular. Maybe i should change my name to The Dragonfly Lady. I was nicknamed Firefly as a teen, but nobody really calls me that anymore. So heads up, I may change my name, you never can tell about me. I am Gemini. I bore easily.. The latest weird occurrence in my life was when I made a Dragonfly for a lady who wanted it sent to her daughter as a 'just because' gift. I carefully crafted it, paying attention to every detail. It was perfect, I asked my Mom to print the shipping label for me. It took a couple of days to get it from her as she lives out in the country and, although my Dad makes several trips to town a day, it just didn't make onto the dash to be delivered to me as Mom kept forgetting about it. Finally, I retrieved it from the dash and hurried to package and ship the dragonfly. Shew! Thank goodness, it's on it's way! A few days later I received a message on ebay from another customer I had sold a dragonfly to months ago.. She was so excited, "It's just gorgeous!" she says, 'I would like to keep it, I will pay you for it." Now what in the world is going on here? I sold the dragonfly on Etsy and printed a shipping label to Ohio, right? So why is it in Illinois? Hmm.. I investigated further. Both ladies were named Dana, but the last name was different, the states were different. Could it be possible she used her maiden named and had moved? (maybe she got a divorce?) I asked her about her mother's name, and told her that if that was her mother than it was gift from her. She replied that her mother had died this past June, she wished it was a gift from her. She told me that she'd like to think the mix-up was 'meant to be' and could she please keep the dragonfly. I felt absolutely awful! What could I do? I arranged for her to pay me thru PayPal and let her keep the dragonfly. But what was I to tell my Etsy buyer? I was so embarrassed and confused. Oh hey, By the way, that dragonfly you ordered for your daughter, well i sent it to the wrong person and she was intent on keeping it so I let her have it. How awful! I did the only thing I knew to do, I told the truth, which is all I really know how to do, I'm a terrible liar. ﻿﻿I promised I'd make another dragonfly for her daughter. It took forever to get it mailed again, with getting the shipping label from my Mom's computer to me. I finally had to ask my daughter to print it and I felt so bad about the whole thing I made another dragonfly and sent it along too as a free gift. It took all day to make the dragonfly, me being such a perfectionist. So in a day or so somebody will receive two very lovely dragonflies and hopefully that will bring a smile to her face and brighten her day a little Let's just hope that, it goes to the right Dana this time and there's not some other unbelievable occerrance! The lesson learned from all of this? BUY A PRINTER!! Most of my days are spent babysitting my two granddaughters, Lily and Jasmine, and taking care of my son Andrew. In between that and regular housework and taking care of 10 cats, a rabbit, a guinea pig, and the latest guest a giant praying mantis - I somehow find time to make jewelry and when I do I will share my latest creations as the days pass as well as events that happen in my life and my families lives so check back often to see what we have been up to.